Asolo's Revert is a mid cut, light weight, suede/synthetic walking boot. On first sight, it looks like it will offer good protection for your feet and ankles. It has good degree of stiffness both longitudinally and laterally plus a good solid toe box. The outer sole looks substantial with good, 3 mm deep lugs. There's generous padding around the ankle cuff, tongue and in the foot bed. I really liked the lacing system - described by Asolo as 'classic' - it was really very easy to get a good fit. On the subject of fit, I'm female but was wearing the men's boot (there is a women's fit available). Previous experience with Asolo has led me to go for a half size bigger than my normal - which is what I did in this case. I also tend to need a broader fitting boot. For this reason I think, I found the men's fitting to be fine for me. These have been extremely comfortable boots for me during several low level walks and a few longer days' out around (an often very wet) Dark Peak. Traction over mud, wet grass, asphalt has been absolutely fine. My heels were held well in place and feet felt well cushioned over some fairly mixed terrain. A light weight, well priced, contemporary looking, 3 season walking boot that's comfortable for all year round walking in all but the coldest/snowiest conditions. 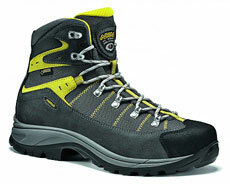 Robust enough for mountain walking yet light enough for the less challenging stuff as well.